Shares of the travel rating and booking company have taken a beating in the past couple of years. Is it time to buy in for future growth, or will the dip just get deeper? TripAdvisor (NASDAQ:TRIP) has been disappointing Wall Street lately, and its most recent earnings report left investors questioning once again if the stock has a chance of ever rebounding to its former highs. The share price has been cut in half over the last two years. But could there be good reason to buy the stock on this dip, on the idea that the company could pivot toward expanded sales growth in 2017 and beyond? TripAdvisor grew its brand name and user base as a site rating travel destinations and accommodations through in-depth traveler reviews, and was originally focused on generating advertising revenue based on the number of eyeballs its review sites were getting. Eventually, that just wasn't enough, so the company decided to transition its platform to also take advantage of finder-fee revenues earned when travelers made bookings directly through its site. In other words, it became an online travel agent (OTA) similar to Priceline (NASDAQ:BKNG) and Expedia (NASDAQ:EXPE). In 2015, TripAdvisor rolled out its "instant book" service, allowing those who visited the site looking for travel reviews to then book directly. Building out the platform was an expensive endeavor, and investments in upgrading and tweaking it for better monetization will likely continue to be a major cost for the company in 2017. Another transition TripAdvisor is undertaking is from desktop to mobile, and (as is the case for many companies) that is coming with the challenge of figuring out how to make mobile traffic convert as well as desktop traffic did. TripAdvisor now gets about half of its traffic from mobile devices, but that traffic only converts about 30% as well as desktop. The company has been investing heavily in better mobile technology and experiences in an attempt to offset that drop. TripAdvisor is far smaller than its peers, both by market cap and sales. In the past, the market has put a premium on TripAdvisor for its apparent ability to disrupt its bigger rvials, but unfortunately for those investors, the slow sales growth for the last few years has helped to push the stock price down. 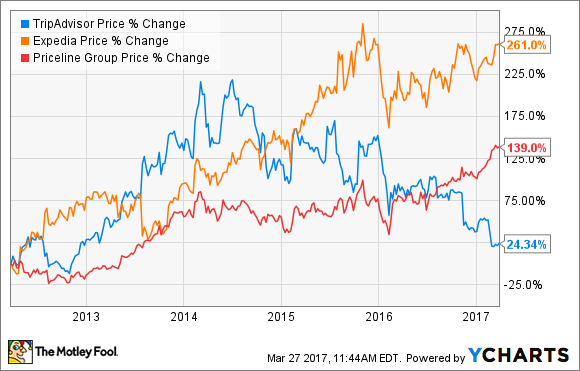 All of these companies saw their earnings per share dip in 2016 as they increased investments, but Expedia and Priceline still produced impressive top line growth, which has helped push their stock prices up. Is it time to buy TripAdvisor? There has been recent market chatter about a potential acquisition or merger between TripAdvisor and Priceline. Similar rumors about such a possibility have made headlines a few times before, but no actual plans were ever announced. The thought of the combined company is very interesting, as it would give both brands something they much need -- quality traffic for Priceline and experienced travel booking features for TripAdvisor. Still, betting on a potential merger is always a gamble. However, there appear to be plenty of interesting reasons to buy TripAdvisor on its dip beyond the possibility of its acquisition. Let's not forget that TripAdvisor is still by far the most visited travel site in the world, with nearly 400 million monthly unique users, up 14% from this time last year, and with user reviews and opinions that grew nearly 50% in 2016 to 465 million. TripAdvisor is working to increase its partnerships across hotel, travel, local experiences, and other areas so it will have more to offer visitors than just accommodations, including bundling. It's been investing in growing its base through acquisitions, and now owns nearly 30 brands, such as JetSetter and Viator, which diversify its business and offer new opportunities for future growth. At the end of 2016, the company had $746 million in cash and equivalents, with only negligible amounts of debt -- positioning it to continue making strategic acquisitions and investments in its platform. Is it time to buy TripAdvisor? Its slower-than-expected return to earnings growth is disappointing, but the company still seems to have a lot of growth potential, especially as its evolves a better understanding of the market for its Instant Book platform, and increases conversion rates and sales. The platform recently celebrated its first anniversary in North America, and revenues for that region were positive year over year in Q4, a good sign that the same could follow as the platform rounds its one year anniversary worldwide this quarter. In TripAdvisor's most recent earnings call, CEO Steve Kaufer said: "While our accelerated instant booking launch garnered most of the headlines during the year, it was but one of many ongoing initiatives that positions our business for long-term growth. At $1.3 trillion in global spend, the travel opportunity is large and growing and remains intensely competitive. We have a lot of work to do to capture our fair share, but we believe we are now very well positioned. As we move into 2017 we see faster revenue growth ahead." If that's true, the stock could be set for renewed gains.